WASHINGTON — President Donald Trump on Friday announced a deal to temporarily end the longest government shutdown in U.S. history, capitulating — for now — on his demand for billions of taxpayer dollars to build a southern border wall. Under Friday’s agreement, federal workers will receive back pay for the time they were furloughed. “I will make sure all employees receive their back pay very quickly — or as soon as possible,” Trump said during a White House Rose Garden appearance. The realization that it was time to reopen the government, despite not having achieved any of the president’s desired funding for a border wall, came as the result of new pressures as the shutdown’s impact became more deeply felt. “Friday is payday,” said the official, who also pointed to the delays at major airports and similar issues at the IRS, where employees assigned to process refund checks were not reporting for work. Senate Majority Leader Mitch McConnell, R-Ky., who earlier had tried to distance himself from the shutdown and the talks to end it, praised the deal. “We’ve had a good outcome on a bipartisan basis,” he said. 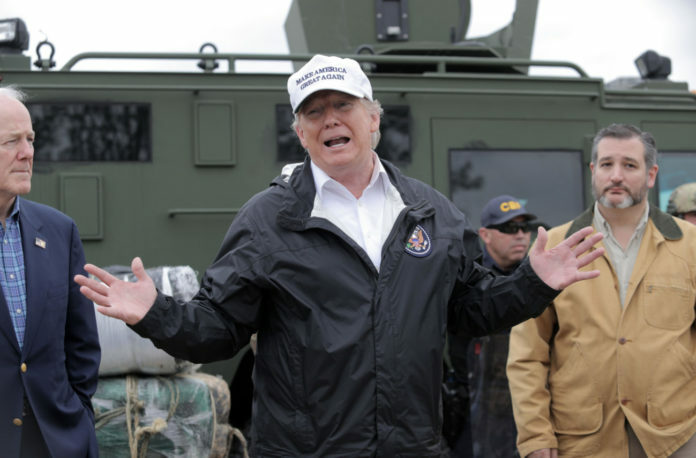 “This is a good-faith gesture by the president to say that he’s interested in actually getting this done, that he recognizes the hardship this has been on people,” said Sen. David Perdue, R-Ga.
On Capitol Hill, Republicans were hopeful they would get something out of the record-long government closure —”some modicum of border security that the president campaigned on — one of the centerpiece items of his campaign,” said Sen. Mike Braun, a newly elected Republican from Indiana. The Senate passed the bill Friday afternoon and the House was expected to follow shortly after, sending it to Trump for his signature. “We just have to operate in good faith,” said Sen. Debbie Stabenow, D-Mich.